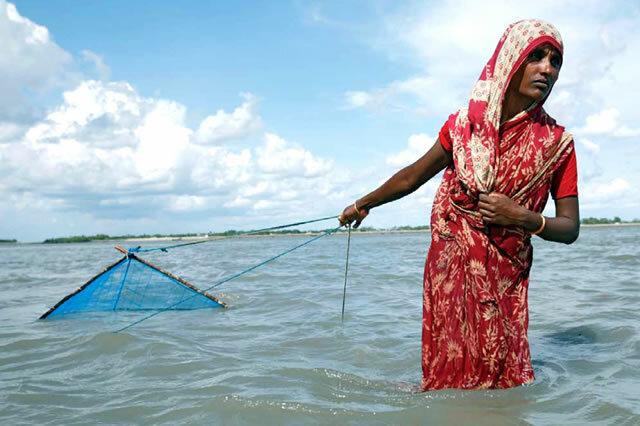 Coastal Regions of Bangladesh have been hit by increased flooding in recent years - causing salt water to enter fresh water supplies and making many forms of farming unviable. Catching shriimp fry is one of the few ways left for people to earn a living. “To come to Bangladesh is to see that climate change is most severely affecting the people who have contributed least to causing the problem” said Mary Robinson during a keynote speech Wednesday, at a roundtable meeting on ‘Climate Change: Rights and Justice’ hosted by BRAC University in the Bangladeshi capital Dhaka. Mary Robinson emphasised the need for a people-centered approach when dealing with the affects of climate change. Referring to her visit to the cyclone-affected areas of Satkhira District in South-western Bangladesh on Tuesday, the the Foundation President praised the resilience of the Bangladeshi people in coping with the devastating effects of Cyclone Aila. Chaired by BRAC executive director Mahabub Hossain, the roundtable was also addressed by Environment and Forest State Minister Hasan Mahmud, BRAC university vice chancellor Ainun Nishat and Bangladesh Institute of Development Studies Research Director M Asadu-zzaman. Giving conservative estimates, Minister Mahmud said that by 2050, nearly 30 million people would be displaced from the coastal regions of Bangladesh due to erosion, inundation and salination of fresh water. Mary Robinson noted how “the farmers were very aware of the issues they had to contend with, the need to diversify… and try out new forms of farming” in their efforts to adapt to the changing climate and the adverse effects this has had on their livelihoods already. She noted however, that “despite all the promises…we’re not seeing a real commitment to adaptation yet”; Fast Start Finance for the years 2010 to 2012 is heavily weighted in favour of mitigation. There is a need for more balanced funding for mitigation and adaptation and this should be reflected in the new Green Climate Fund. Travelling by seaplane to Koyra, in the delta area of Bangladesh, was the equivalent of a journey some years into the future, when the devastating effects of climate change will be an accepted reality worldwide. We landed in an area still devastated by cyclone “Aila” which hit Bangladesh in 2009. A huge amount of once cultivated land was still under water, because of daily tidal fluctuations and the fact that some embankments had not been mended in the nearly two years since Aila. Together with my BRAC hosts I was driven to meet local farmers and fishermen and women. BRAC have a big programme in Koyra covering education, and advice on climate resilience to over a thousand villages, including training on how to adapt their livelihoods to cope with the brackish, salinated water that has covered their farmlands and traditional fresh water fishing.